I realized right around the time I should have started dinner that it was Cinco de Mayo. Of course I knew it was May 5th, but what that day on the calendar meant didn’t register until food was involved. Yup. That’s how my brain works. Holidays, any holiday on the calendar, means something good to eat. I wasn’t sure, however, since I decided not to grocery shop until morning, if there would be anything in the fridge or pantry to make a festive dish. Chicken breasts were already thawed, waiting to be transformed into dinner. I found a can of crushed tomatoes and a little cilantro I hadn’t used up through the week. 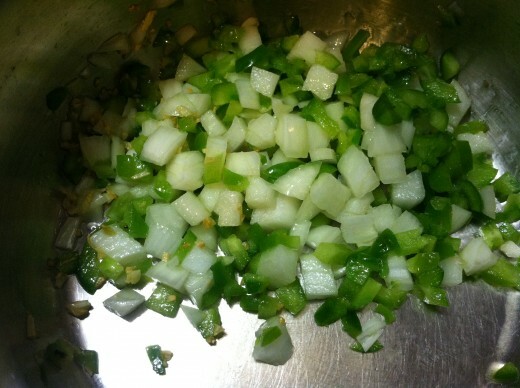 Possibilities… Then there were the bell pepper ends I had left from making scrambled eggs. Colby/Jack cheese was on sale this week so, for once, we had it on hand as well. 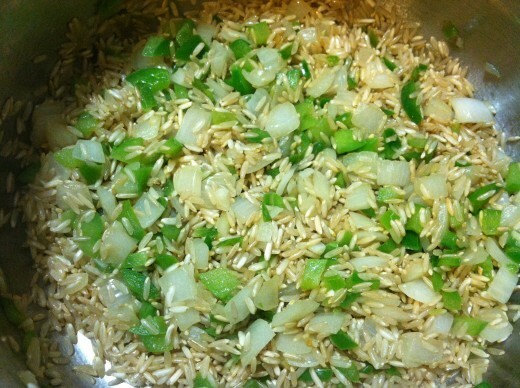 Brown rice is a pantry staple. All I had to do was put it all together. I grabbed what was left of a jar of organic peanut butter and a tub of turbinado sugar while I was in the pantry getting the rice. 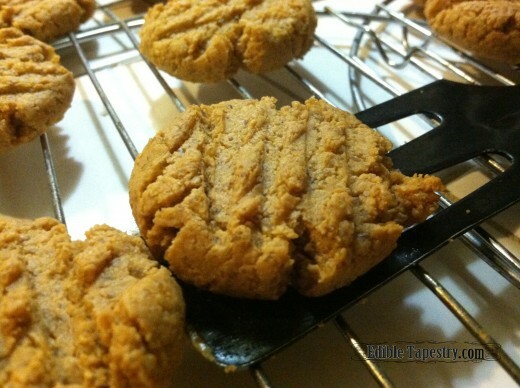 I decided that, though not something I think of as Mexican, peanut butter cookies would be a nice treat to end our flavorful meal, whatever that would end up being. I decided to make enchilada sauce. 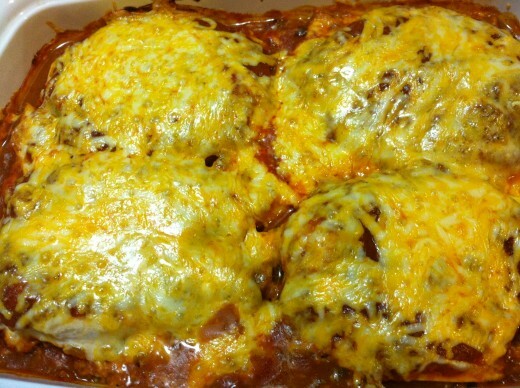 My next idea was to stuff the chicken breasts and dump the sauce on top. Stuff with what? Cheese. Boring. 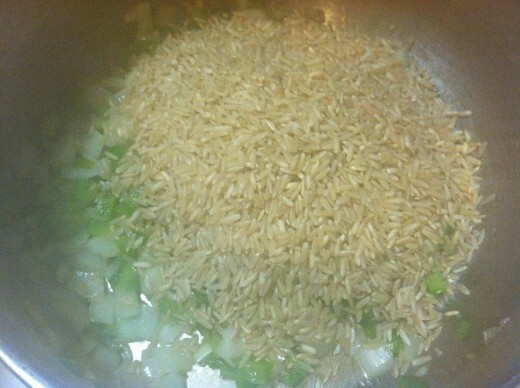 I started a pot of Mexican rice instead. It’s always good. Well, except for when I decided to make it for a slew of people, of course. Something had to give that night. It was my sons’ end of the world party, our laugh in the face of the Mayans gala, to be exact. There was mole, Mayan hot chocolate, chicken, enchilada sauce, rice, beans, guacamole, salsa, games, raffles, trivia, and…the apocalypse cake. 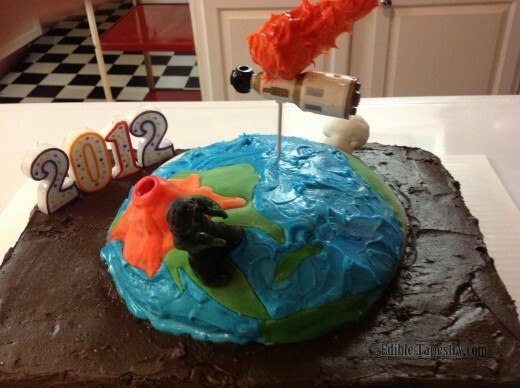 Our “end of the world” cake. It featured a meteor taking out the I.S.S., a zombie, the Yellowstone volcano, and a mushroom bomb. Four of the doomsday scenario possibilities of 2012. It was FUN to make. The rice suffered that night. I ignored it, talked with guests as I was finishing it, forgot that I was using white rice rather than brown and ended up with a big pot of mushy rice. My kind guests didn’t say a word. Thank you, kind guests. That pot of rice absolutely stunk. But it usually turns out pretty well. Tonight’s was spot on, thank goodness. I didn’t have the ingredients or time for a redo. 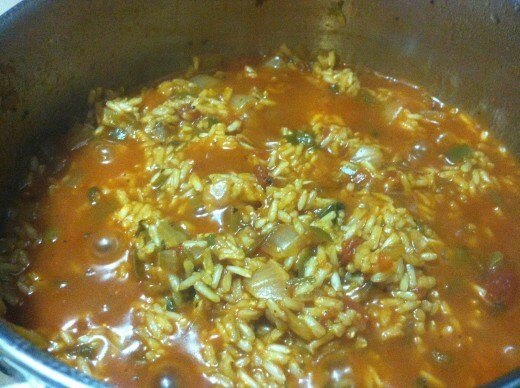 So I made the rice and the sauce. 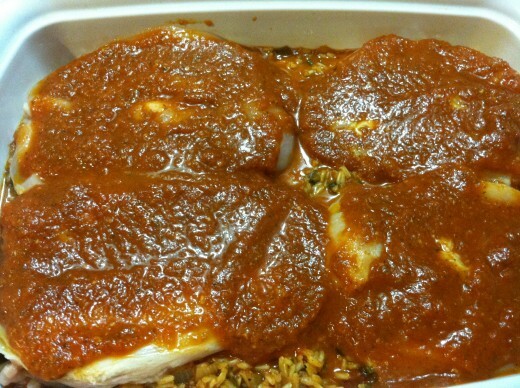 Then I spread the rice in the bottom of a baking dish and butterflied my chicken breast halves. On went the sauce, then my colby/jack. The last three tomatoes in the produce drawer made a nice salsa. I’d intended to bake the chicken dish for an hour, covered. But forty minutes after shoving it in the oven it was up to temp. 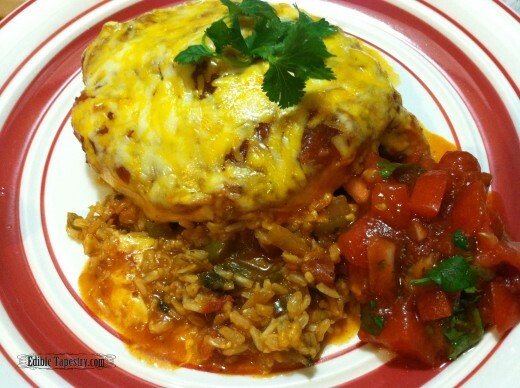 and the cheese was melted into luscious pools over the rice and chicken. I thought I would miss all the extras like sour cream, guacamole, and corn tortillas. Nope. I had peanut butter cookies!! I started the enchilada sauce first, since it simmers for one hour. 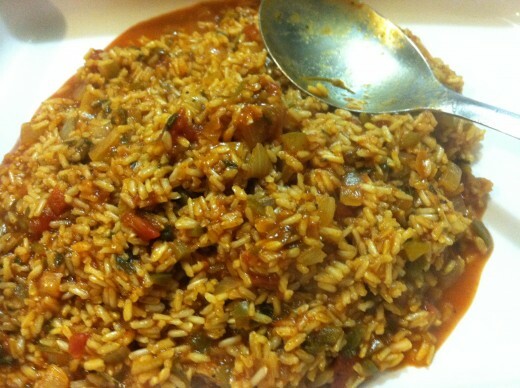 To make the rice, heat the oil in the bottom of a medium saucepan over medium to high heat. Add the garlic and sauté. To the garlic and oil, add the onions. Sweat. Add bell peppers and sauté until translucent. 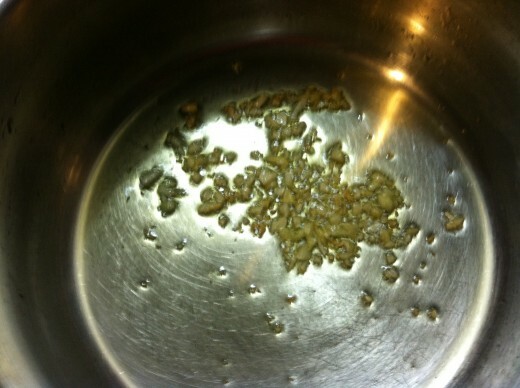 Stir until toasted, 1 to 2 minutes. Add the water, tomatoes, and seasonings. Bring to a boil. 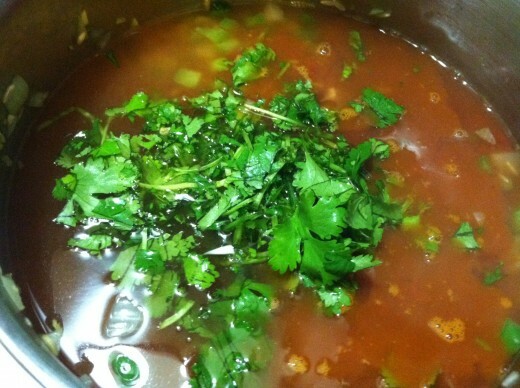 Reduce heat to a low simmer and cover. Cook, stirring occasionally, for 30 to 40 minutes, or until rice is almost finished, but still a little firm. Puree the simmered enchilada sauce. 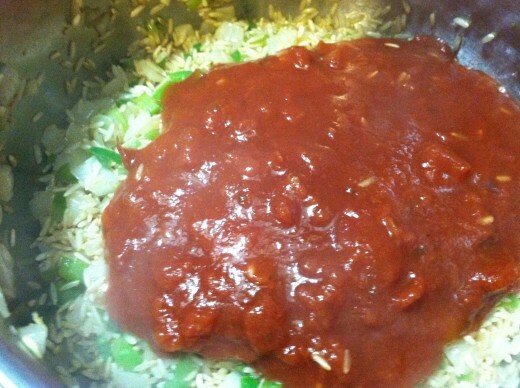 Spread the rice in the bottom of a 13 x 9 inch baking pan. 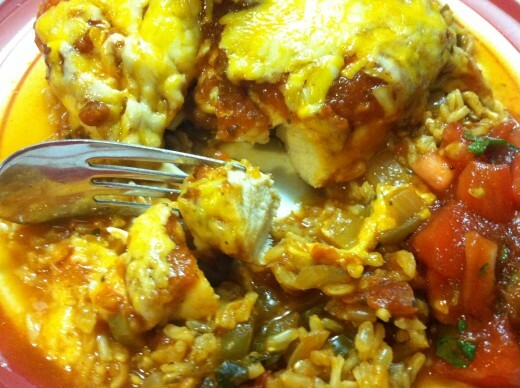 Lay the butterflied chicken breasts over the rice. 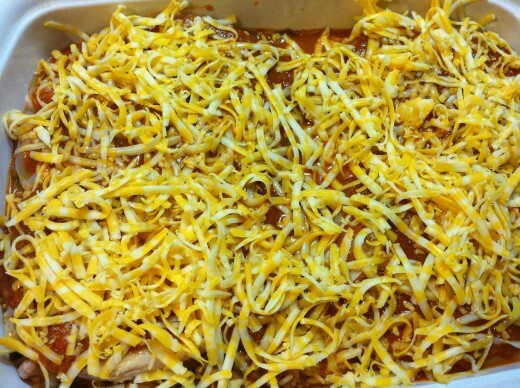 Pour the enchilada sauce over the chicken. Bake for 40 minutes, or until the chicken reaches 165 on a meat thermometer.